This example shows a somewhat rare example of the underlying placement of the tiles, as they do not meet edge to edge. As to the composition itself, consisting of two distinct tiles, it will be seen that both have order 4 rotational symmetry, and so consequently this thus opens up plenty of scope for the placement of the motifs, of which after numerous studies the following was selected. Of the birds themselves, in an aesthetic sense, the more ‘squat' bird can be seen to be not of the highest quality, as arguably it can be described as ‘overweight,' and not essentially streamlined, as a real life bird would be. 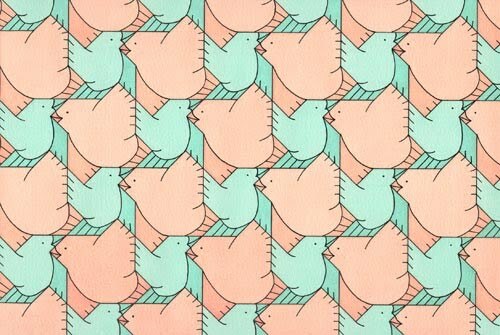 However, seemingly as ever with tessellations, compromises are inevitably in order, and as such although obviously not ideal, nonetheless I still consider that such an example, of the above rare type of tessellation, is thus in the circumstances justifiable for inclusion. Each of the two types of bird is coloured with two colours, with red and yellow for the 'squat', and blue and green for the 'standard' bird. 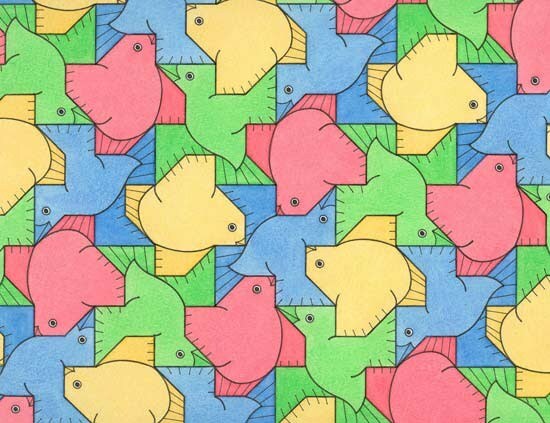 Firstly, as this example possesses some subtleties that are not readily apparent at first glance, the reader may first want to test their ‘appreciation' of this tessellation by examining it in more detail before reading the following text. This example is somewhat more complex in concept than with most of my tessellation, as it is of a type that I term as ‘Mother and Young', a term that without further explanation would not be at all obvious as to its intricacies. 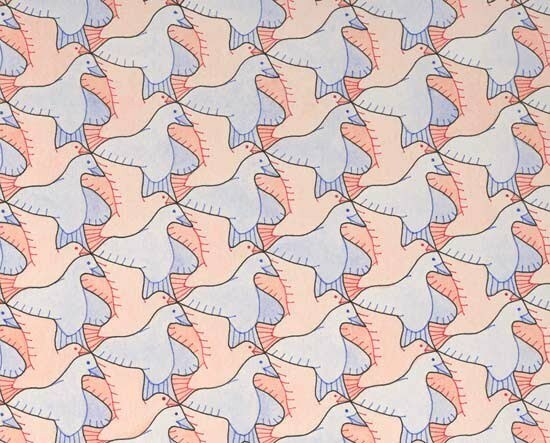 Now, upon observing the tessellation, in simple terms it can be described as of a less frequent larger bird along with more frequent smaller birds, from which the concept of ‘Mother and Young' might thus be apparent, albeit the true value is somewhat more involved than such a simple description, as subtleties lie behind this. Now, if the larger and smaller birds are examined (the latter in groups of four) it will be seen that in both cases the outline is the same. 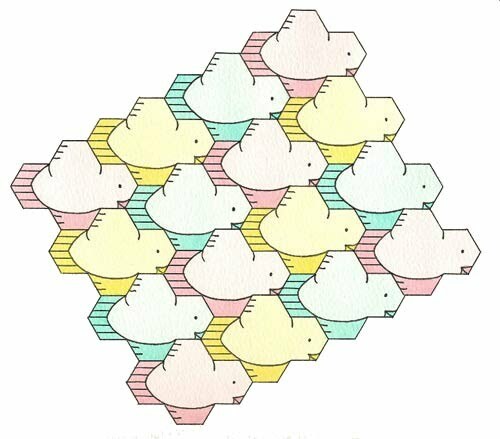 From this, the interpretation is that by subdividing this larger tile into four identical smaller ones, the notion of ‘Mother and Young' thus more directly arises, as the mother bird has thus literally given birth to the (four) smaller ones. 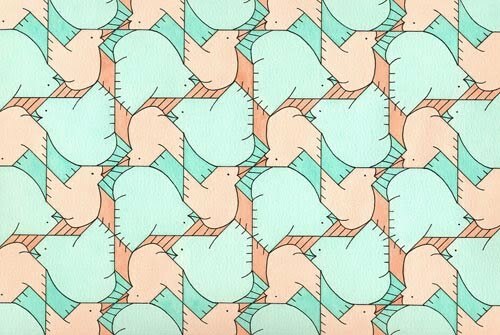 As such, a most pleasing tessellation as the concept behind it is most subtle and rare, and is therefore of more interest than any other ‘arbitrary' tessellation. A further example of the use of this tiling outline, involving the larger bird and neglecting the ‘subdividing' aspect, is shown as Birds 1, No.5 and Birds 2 No.3. A minimum of three colours is required, from which a 'simple' colouring is given, with the 'mother' bird in blue and the 'young' in red and green. 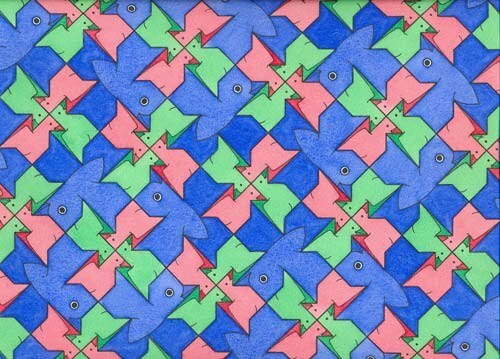 This tessellation consists of an example of what I term as ‘multiple motifs', of which I discuss more fully in Essay 1, and so the relative rarity of such examples makes this of more interest than normal. The example here is a most impressive effort, as no ‘compromises' are in order, with both motifs remaining true to life despite the additional difficulties imposed upon such configuration. Furthermore, both motifs are aesthetic, as they remain upright, of which such matters effectively 'enhance' the tessellation. An arbitrary combination of blue and red is chosen. As a change from delineating the feather and tail with black lines, these are shown with each of their inherent bird colour. This and the following (No.5) are interrelated. The two examples essentially show different placements of the bird motifs, as both tiles possess order 4 rotation symmetry, and so consequently there are four possible placements of the (bird) motif in any one tile. The examples above and below show examples with a high degree of symmetry, with No.4 showing a single placement (translation) and No.5 showing two placements (order 2 rotation). Complementary colours of red and green are chosen for maximum contrast. For comments and colouration pertaining to this see No.4. A minimum of three colours is required. An arbitrary choice of red, yellow and green is used.